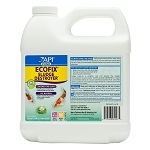 Using natural bacterial products to clean is an easy and safe way to keep your pond clean. Sludge buildup from organic waste, leaves and dirt will buildup on the bottom of the pond and other surfaces in the pond. This is unsightly and can rob oxygen from your plants and fish. Products are available in both dry and liquid forms whichever you prefer.